Hello hello, Gemini! The quick-witted, fast-footed, double-minded sign of the Celestial Twins. Universal energies are stirring up a fun and talkative mix of synergies and synchronicities. Communication flows fast and furious, as do ideas, crushes, impromptu party plans… and the slightly higher risk of misunderstandings in such a dynamic, excitable atmosphere. Be mindful of what you say and how you say it! This Thursday’s New Moon in Gemini offers the potential for new (or deeper) friendships that are based on shared ideas + intellectual pursuits, as well as opportunities for travel and education. Beware the square, though: On Thursday, loving Venus in impulsive Aries locks in at a 90-degree angle with secretive Pluto in uncompromising Capricorn. Again, be careful of what is communicated because Gemini-esque repartee can go overboard, and an impulsive remark or the exposé of a secret opinion could lead to completely unnecessary tensions. do not tell your girl she looks fat in her hot pink elastic hotpants. Especially not this Thursday. And now let’s hop onto This Week’s Tarot – here we go! LEFT: TEMPERANCE REVERSED. Your energies might be somewhat unfocused at times this week; there’s a sense of needing to get sh*t done but lacking the patience (or conversely, the impetus) to do it well – or to do it at all. When in low-vibrational mode, Gemini energies can be fickle, scatter-brained, and noisy/restless but unproductive (you know what they say about empty vessels…). Now that the Tarot has given us a heads up on likely energies this week, how will the Tarot advise us re: working around them? MIDDLE: PAGE OF SWORDS. Here’s your advice, darlings. 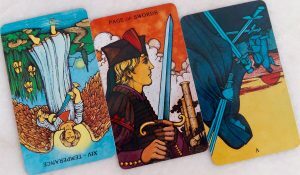 The Page of Swords indicates the kind of restless energy, intellectual conceptualisation, and keen curiosity that will help us out of the rut of a reversed Temperance. Ask questions when in doubt; remember Google is your friend; take breaks outdoors and get some fresh air (the traditional Rider-Waite portrayal of the Page of Swords depicts the wind blowing in his/her hair). Ask questions when in doubt; remember Google is your friend; take breaks outdoors and get some fresh air. RIGHT: FIVE OF SWORDS REVERSED. And here’s advice on what to avoid. This card represents unethical conduct, aggressive rivalry, conflict and isolation: with Mars currently in Gemini, expect some belligerence. Tap on the high-vibrational energies of Gemini: work towards consensus, effective communication, and collaboration. Keep a distance from gossips, backstabbers, and “my way or the highway” types. More importantly – keep your own hands clean, stay out of quarrels, and if you find yourself in one somehow, fight fairly. If conversations get intense, a simple rule is to listen twice as much as you speak, and be observant of other people’s non-verbal cues. We learn so much when we are open to receiving, and so little when we only fight to win.